“Among the highlights of Chandler’s Route 66 landscape is the Chandler Armory, behind which stands the only brick outhouse in Oklahoma, thought to have been built between 1903 and 1912 and still containing its original French fixture. The Chandler Armory is an excellent example of Works Progress Administration (WPA) architecture; it is rich with history. 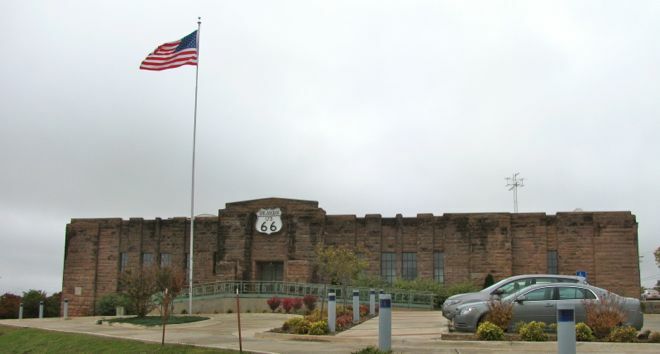 The armory is also significant as the home of Battery F, Second Battalion of the 160th Field Artillery of the Oklahoma National Guard, 45th Infantry division and for its role in helping the men of Battery F prepare for their role in World War II after mobilization in 1940. Bryan W. Nolan, an architect and major in the National Guard, served as the supervising architect for the WPA armory construction program in Oklahoma. Constructed of local sandstone, the armory’s recessed stonework and projecting pilasters give the building a vertical emphasis and an Art Deco influence. You’d never mistake the building for anything but a military installation. There are five big-truck-sized bays with overhead doors, and one section of the building is topped with those barrel vault roofs utilized by so many 1930s military structures. The WPA built the Chandler Armory in two sections between 1935 and 1937. The eastern half of the building contains offices, locker rooms, truck bays, an ammunition vault, and classrooms. The other half is mostly drill hall. At one end of the hall is an elevated stage, and beneath the stage is a long, narrow rifle range. Oklahoma is tornado country which may be why the armory was built so soundly. Not only are the walls made of sandstone, but the roof of the drill hall was constructed of half-inch cellutex insulation and five-ply built-up felt and asphalt laid on metal sheeting supported by steel trusses also. 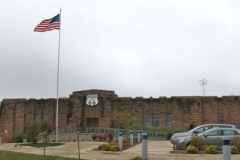 All in all, the Chandler Armory is evidence of the intention and the success of the WPA program. It used native materials, served the public, and employed local workers. More than 250 men worked the local quarry to keep laborers at the jobsite supplied with material. Staggered crews of 14 men were employed on the jobsite, because the schedule provided as much employment as possible for workers in need of jobs. Workers dressed the stone and hoisted it into place by hand. The wooden floor of the drill hall required a great deal of hand labor, too. Workers cut more than 156,000 wood blocks on the jobsite and set them into place manually. During the Great Depression, the armory put Chandler to work. 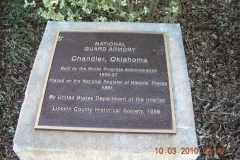 The building now houses the Chandler Route 66 Interpretive Center, a conference center and an exhibition hall. Listed on the National Register of Historic Places March 14, 1991. On June 20, 1935, The Chandler News-Publicist stated that Chandler was almost assured a new armory. 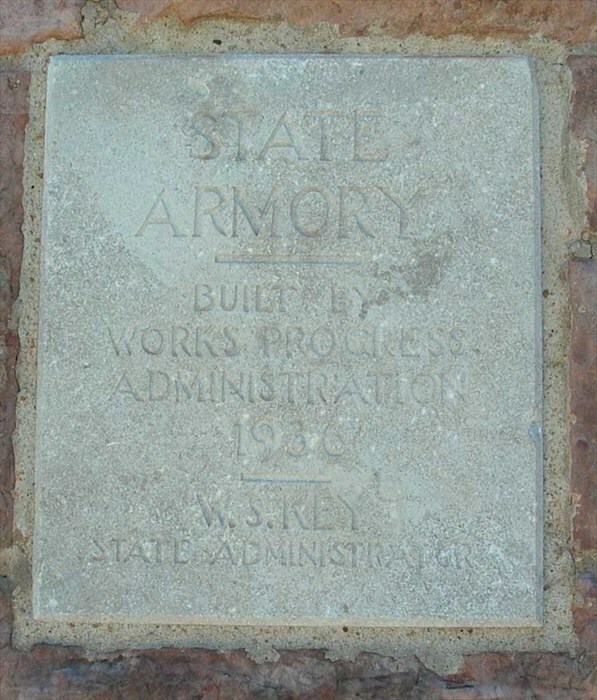 Of the armory building program in general, the newspaper quoted Oklahoma Congressman Josh Lee as saying, “The armories would serve as community centers, replace old and inadequate structures now being used in many places by the guard, create work for thousands of unemployed laborers, and serve as a permanent improvement for each city in which they are constructed.” By late August, Captain Louis G. Hurst, commander of the local guard unit, had received the plans for the armory. The city chose to locate the building in the old city park at the juncture of First Street and U.S. Highway 66. Work on the project began in October 1935 with the quarrying of the native sandstone at the D. Powers farm northeast of Chandler. Ground-breaking for the building was held on November 19, 1935. 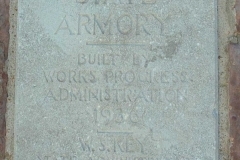 Although a local newspaper estimated that the armory would be finished by the spring of 1936, it was not completed until the late winter of 1937. On March 1, 1937, the armory was officially dedicated with a community-wide celebration complete with a parade/ open house, laying of the cornerstone, a banquet, and a dance with music provided by the WPA swing band from Okmulgee, Oklahoma. Because Chandler was located in a largely rural county, the construction of the armory provided a much needed influx of money into the city’s economy Although more money was expended on farm-to-market roads and other road improvements in Lincoln County, as of late October 1936, the Chandler Armory was the largest single “building” project in the county. By that date, the federal appropriation for the building was $36,520.35. With the inclusion of the city’s contributions for the project which included the site and part of the expense of transporting the material, the total value of the building was estimated to be $50,000.^ This expenditure of money not only helped individual families but also benefited the local merchants and material suppliers. To provide as much work as possible for those listed on the relief rolls, WPA projects were designed to be labor-intensive* Local newspaper accounts attest to the labor-intensive nature of the work on the Chandler Armory. During the early phase of the construction, approximately 250 men were working at the quarry in order to keep the laborers at the jobsite supplied with enough material. Staggered crews of fourteen men were employed on the jobsite. The staggering plan was used in order to provide employment for all eligible workers. At the jobsite, the stone was dressed and hoisted into place by hand. Not only the stonework, but also the work on the drill hall floor required a great deal of hand labor. More than 156,000 wood blocks were cut on the jobsite and set in place with hot asphalt and surfaced with linseed oil and turpentine. As the project neared completion, twenty-nine men were working on the building. 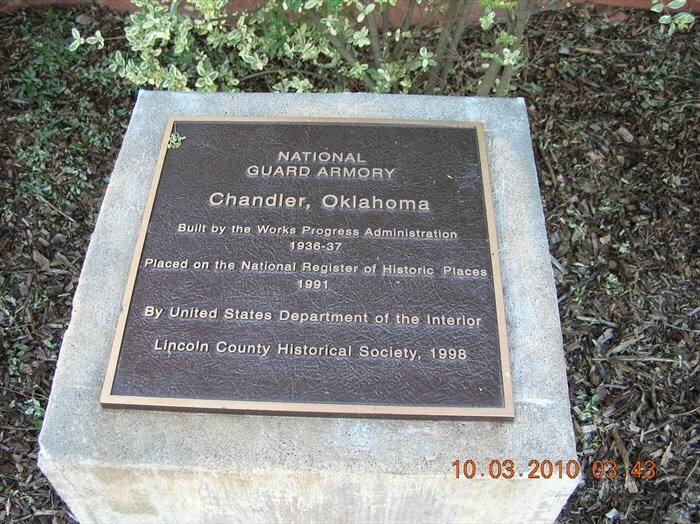 The Chandler Armory served as the home of Battery F, Second Battalion, of the 160th Field Artillery of the Oklahoma National Guard.